The Hyundai Santa Fe has been redesigned for the 2007 model year. Compared to last year's model, the new Santa Fe is larger, safer, more powerful and more luxurious. For many suburban families, the midsize crossover SUV represents the ideal vehicle. It's less cumbersome than a full-size SUV but still big enough to haul around the kids, the dogs or the latest desirables from Pottery Barn. Weather-beating all-wheel drive is usually available and, as the top bonus for many people, it's not perceived as being geeky like a minivan. Perhaps not coincidentally, then, this midsize sweet spot is exactly where Korean automaker Hyundai has positioned its fully redesigned 2007 Santa Fe. The original Santa Fe, while certainly competent, never quite matched up to top offerings from Japanese automakers in terms of refinement. Looking toward improvement, Hyundai designed the second-generation Santa Fe on an all-new, purpose-built unibody crossover platform. Its wheelbase is longer than before and overall length is up nearly 7 inches. Hyundai says that this chassis was specifically designed to deliver a better balance of ride and handling. The body structure is also considerably stiffer, and new suspension geometry has actually tightened the Santa Fe's turning circle. On the outside, the new Santa Fe has a much sleeker look and is about the same length as a Toyota Highlander. Inside, the new body pays dividends in terms of interior space. A third-row seat is now optional and overall headroom, legroom and shoulder room measurements are equal to or better than those of many competing SUVs. Hyundai spent a lot of time on interior design, and the result is a very attractive dash and high-quality materials. Mechanically, the 2007 Hyundai Santa Fe features two- or four-wheel drive and two available V6 engines. The base engine, standard on the Santa Fe GLS, is a 2.7-liter V6 that was available in the previous Santa Fe but now offers the added benefit of variable valve timing. Replacing the previous Santa Fe's cast-iron 3.5-liter V6 is an all-aluminum 3.3-liter V6 that also sees duty in the redesigned Sonata sedan. Overall, Hyundai has put together a pretty impressive package. Typical core strengths for a new Hyundai -- plenty of features for the money and a strong warranty -- hold true for the Santa Fe, and the old model's gawky styling is thankfully long gone. It should serve suburban families quite well, and we recommend that shoppers interested in this segment consider the Santa Fe one of the top choices. 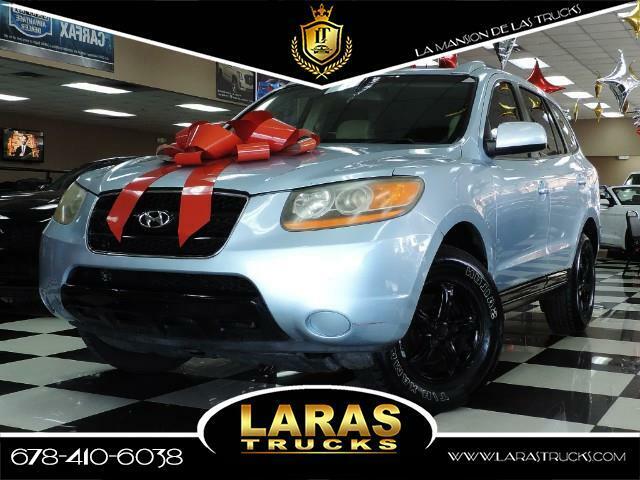 The 2007 Hyundai Santa Fe midsize crossover SUV is available in three trim levels. The base Santa Fe GLS starts things out with 16-inch wheels, power windows, power heated outside mirrors, keyless entry, a tilt-and-telescoping steering wheel, cruise control and an MP3-compatible CD player. The SE trim features a larger engine, 18-inch alloy wheels, an auto-dimming rearview mirror, automatic headlights, a trip computer and steering-wheel-mounted audio controls. The top-of-the-line Santa Fe Limited has the SE's equipment plus leather seating, heated front seats, a power driver seat and dual-zone automatic climate control. All three trim levels are also available with XM satellite radio. Additional features are available through a variety of option packages. Highlights are a third-row seat with auxiliary rear climate controls, a sunroof and, for the SE and Limited only, a DVD entertainment system and a 115-volt power outlet. An upgraded audio system with a six-disc CD changer is available on the SE, and a premium Infinity surround-sound audio system is available on the Limited. Hyundai says it will also have a navigation system available later in the model year. GLS models come with a 2.7-liter V6 that makes 185 horsepower and 183 pound-feet of torque. The SE and Limited feature a 3.3-liter V6 good for 242 hp and 226 lb-ft of torque. For the smaller engine, Hyundai offers a standard five-speed manual transmission (late availability) or an optional four-speed automatic with sequential shift control. The larger V6 comes standard with a five-speed automatic and sequential shift control. All three Santa Fe trim levels come as either front-wheel drive or all-wheel drive (AWD). For the latter, a driver-selectable AWD lock feature provides a continuous 50/50 torque split between front and rear wheels during off-road situations. Properly equipped, the SE and Limited have a 3,500-pound tow capacity. All of the 2007 Hyundai Santa Fe's safety features come standard. This includes four-wheel antilock disc brakes, traction control, stability control, front seat-mounted side airbags, full-length side curtain airbags, front active head restraints and a tire-pressure monitor. In IIHS frontal-offset crash tests, the Santa Fe earned the top rating of "Good." The Santa Fe can seat up to seven passengers when equipped with the optional third-row seat. Naturally, the third row is really only suitable for children, but overall interior room is very good for this class of vehicle. The third-row seat is split 50/50 and can be folded flat, as can the 60/40-split second-row seat. Total cargo volume is 78.2 cubic feet, and there's plenty of storage space. Additionally, high-quality interior materials and a few unexpected touches, such as blue illumination for the dash and rear air vents mounted in the doors rather than on the back of the center console, create an upscale atmosphere. One of our few complaints about the Santa Fe's interior involves the driving position: The seats are mounted too high up front, and short seat-bottom cushions provide minimal thigh support for taller adults. Hyundai describes the 2007 Santa Fe's handling as "engaging" and we think that's about right. The trade-off is that the ride on models equipped with the 18-inch wheels can be very busy on the highway. (Models with 16-inch wheels offer a better overall ride but aren't eligible for the bigger V6.) Pushed hard, the Santa Fe is easy to control and handling is predictable. Around town the brake pedal feels about right, but can get soft during hard braking. Overall braking distances on a FWD Limited model we tested were longer than expected for this class of SUV. The GLS model's 185-hp 2.7-liter V6 might seem underpowered for some consumers, but it does return decent highway mileage. If you're planning on getting an AWD model and/or frequently hauling passengers or cargo, the 242-hp 3.3-liter V6 is probably a better choice. Although the 3.3 V6 with the five-speed automatic is generally competent, some drivers found that transmission a little slow to respond at times.